listen (Mandarin) (help·info); Cantonese Yale: móuh seuht) have distinct meanings. 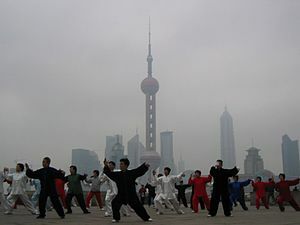 The Chinese equivalent of the term "Chinese martial arts" would be Zhongguo wushu (Chinese: 中國武術; pinyin: zhōngguó wǔshù) (Mandarin). 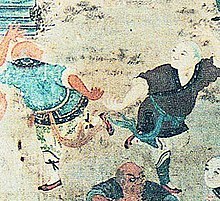 Chinese martial arts are an integral element of 20th-century Chinese popular culture.Wuxia or "martial arts fiction" is a popular genre that emerged in the early 20th century and peaked in popularity during the 1960s to 1980s. Wuxia films were produced from the 1920s. The Kuomintang suppressed wuxia, accusing it of promoting superstition and violent anarchy. Because of this, wuxia came to flourish in British Hong Kong, and the genre of kung fu movie in Hong Kong action cinema became wildly popular, coming to international attention from the 1970s. The genre underwent a drastic decline in the late 1990s as the Hong Kong film industry was crushed by economic depression. In the wake of Crouching Tiger, Hidden Dragon (2000), there has been somewhat of a revival of Chinese-produced wuxia films aimed at an international audience, including Hero (2002), House of Flying Daggers (2004) and Reign of Assassins (2010). ^ Yan, Xing (1995-06-01). Liu Yamin, Xing Yan (ed.). Treasure of the Chinese Nation—The Best of Chinese Wushu Shaolin Kung fu (Chinese ed.). China Books & Periodicals. ISBN 7-80024-196-3. ^ Denton, Kirk A.; Bruce Fulton; Sharalyn Orbaugh (2003-08-15). "Chapter 87. Martial-Arts Fiction and Jin Yong". In Joshua S. Mostow (ed.). The Columbia Companion to Modern East Asian Literature. Columbia University Press. p. 509. ISBN 0-231-11314-5. 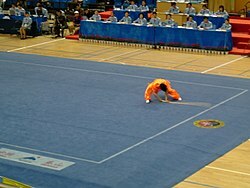 ^ Cao, Zhenwen (1994). "Chapter 13. Chinese Gallant Fiction". In Dingbo Wu, Patrick D. Murphy (ed.). Handbook of Chinese Popular Culture. Greenwood Publishing Group. p. 237. ISBN 0313278083.